Craggy Range Winery and the Pizza Guy have teamed up to steal the show at the 2005 Toast Martinborough festival. Stefan Schmidt, the man behind the Pizza Guy enterprise, was asked by Craggy Range to provide the culinary expertise for some of the upmarket winery’s food selections at Toast Martinborough. During the weekend festival, Craggy Range chefs and the Pizza Guy worked together on a special Toast Martinborough pizza topping to impress the judges in the “top beef or lamb offering” category. The result was a stunning success that had the judges smacking their lips. Craggy Range was awarded the show’s Most Innovative and Consistent Product by the Cuisine Magazine judging panel. The panel comprised: Greg Heffernan (NZ Beef and Lamb Marketing Bureau’s Ambassador Chef), Lauraine Jacobs (Cuisine Magazine), David Burton (wine and food writer) and Catherine Bell (Dish Magazine; Epicurean workshop). The special recipe pizzas included a Japanese marinated beef topping with asparagus and red onions. But it was the quality of the crispy pizza bases that was singled out for praise by the judges. 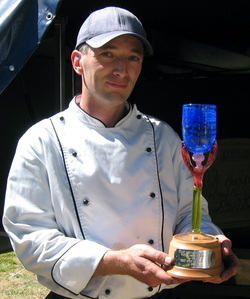 Stefan is a master baker based in Hawke’s Bay. In 2003, he imported a custom-built mobile, wood-fired pizza oven from his native Germany. Since then he has offered his unique French-style pizzas at public events throughout New Zealand.